I guess that applies to the weather too. 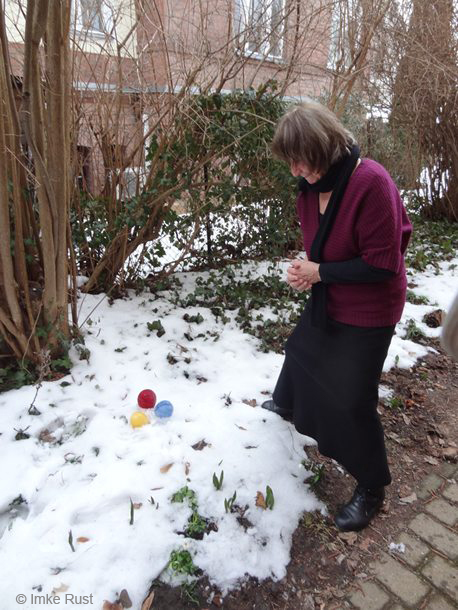 If you cannot beat the cold – play along. So that is what I did for Easter. As I already mentioned in my previous Easter post, I am not really into the whole Easter thing and much to some people’s despair I only ever follow rituals or parts of them, which seem like real fun to me, when I am in the mood for it or if they make some other kind of sense to me (and that does not always need to be the rational kind of sense 😉 ) . 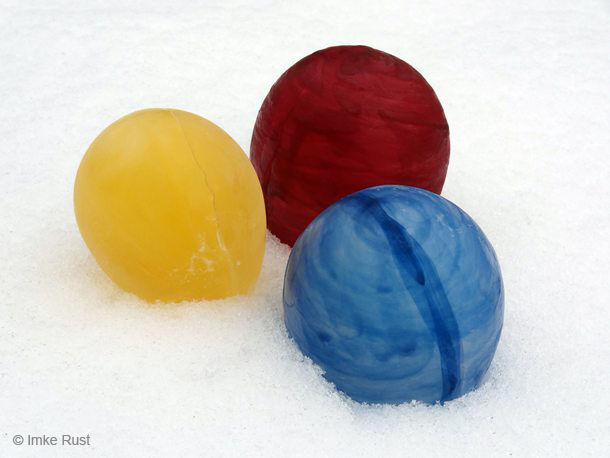 Since we were invited for an Easter dinner and I recently read something about freezing water in balloons, I decided to create some frozen Easter eggs, suitable as an ephemeral gift for the host’s garden and the icy cold weather. 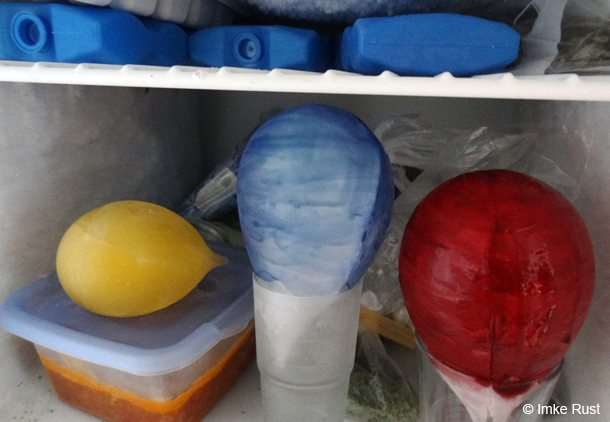 I filled water into balloons and hung them in the freezer. After the water was frozen, I peeled off the balloon. 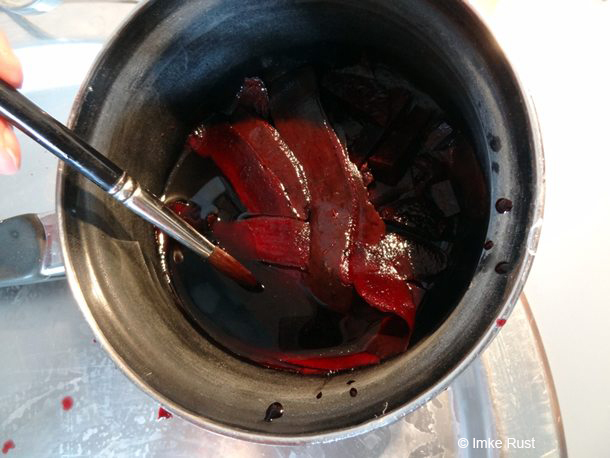 Now I boiled some beetroot peels (the rest of the root was turned into a yummy raw salad) to get a natural and environmentally friendly colour for the red egg. 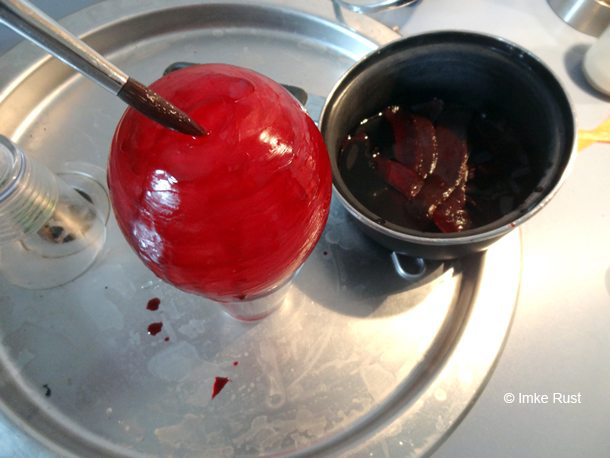 Only at this stage I remembered to take photographs of the process. I used commercial food colouring for the other two eggs as I ran out of time for being more creative in making my own colours. The eggs were stored in the freezer and then transported in a padded cool-box to our dinner hosts. Then the Easter bunny (i.e. me) could not decide, where to place the eggs, to get the best visibility – these eggs were not made for hiding after all. After trying the pretty white snow blanket of the back yard, I decided it is best to place them right in view of the front door, even if there was not an ‘all white’ dense snow covering as I had wished for.But they would be in plain view of everybody leaving or entering the house. Much to my joy, they were well received…. 🙂 And we were treated to a delicious meal and lovely evening. 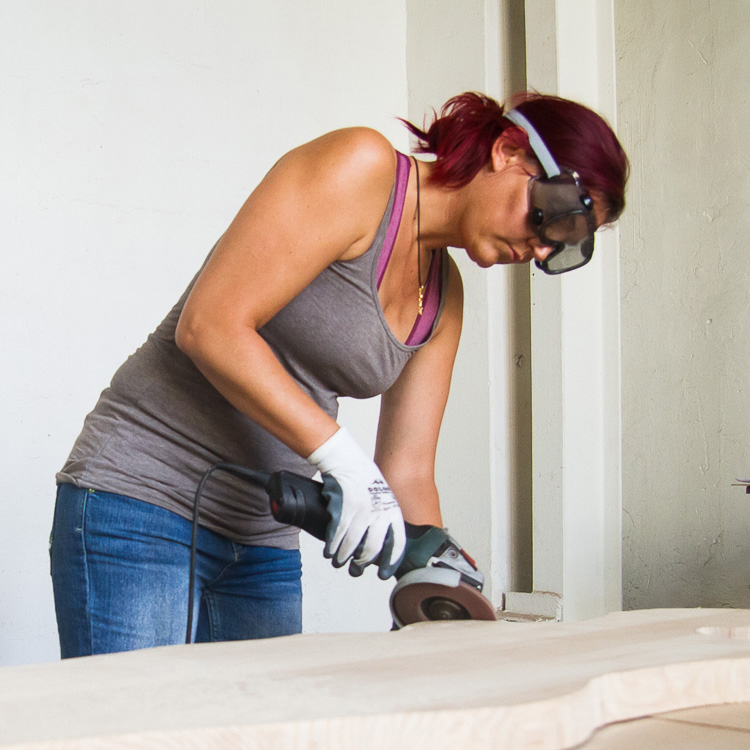 Wishing you a great remainder of the week! 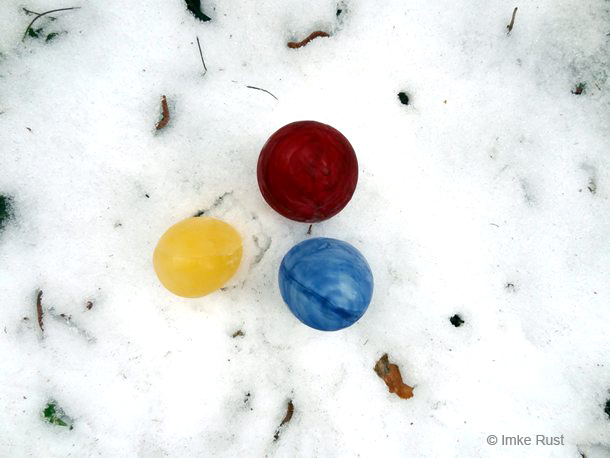 This entry was posted in Inspiration, Land Art, Other art related things I am doing and tagged creativity, Easter, eggs, environment, environmental art, frozen eggs, imke rust, intervention, snow on April 4, 2013 by Imke Rust.